Editors: Dodds, Klaus, Kuus, Merje and Sharp, Joanne, et.al. 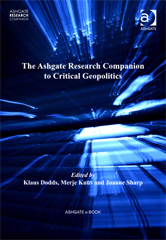 Bringing together leading researchers associated with the different forms of critical geopolitics, this volume produces an overview of its achievements, limitations, and areas of new and potential future development. The Companion is designed to serve as a key resource for an interdisciplinary group of scholars and practitioners interested in the spatiality of politics.